NextConstantius II, the Byzantine autocrat (Part 1). Bullets, blood, sweat and courage: All in a days work for war cameraman Damien Parer. To be a war correspondent, photographer or camera person takes great courage. It isn’t your typical run of the mill occupation where you can decide to go home at the end of a long hard day. Often these people are exposed to the same harsh conditions as ordinary soldiers or other service people. Occasionally they are shot at and targeted by the enemy. International conventions are supposed to protect them from harm’s way, but the reality is often the opposite. On a fateful day on September 17th 1944, Australian cameraman Damien Parer, working under new employers from Paramount News, was filming footage of American marines advancing on the Island of Peleliu in the Pacific. As he was walking backwards to take cover behind an American tank, he was suddenly fatally shot by a burst of Japanese machine gun fire. Damien Parer’s story is only one of millions of lives lost during the Second World War. However, his story is remarkable for many reasons, but ultimately memorable for the images he recorded of Australian soldiers in the Middle East, Greece, and New Guinea. It was while in New Guinea that Parer recorded the Academy Award winning documentary ‘Kokoda Front Line’ showing retreating Australian soldiers in the most desperate of conditions slogging along a mud-bogged track. This is a photograph taken by Damien Parer, of Australian soldiers and a Salvation Army Chaplain, in Merrai Papua 1942. This is a still from a newsreel shot by Damien Parer, of an Australian soldier assisting a wound colleague to an advanced regimental aid post, July 1943. Parer learnt his craft as an enthusiast photographer while at school. Later he completed a photographic apprenticeship and moved into motion pictures under the direction of Charles Chauvel, a notable early pioneer of Australian film. It was during the Second World War, that Parer career detoured into a new direction, when appointed by the Australian Imperial Force as an official war cinematographer. His appointment led him first to the Middle East, where Parer cemented his reputation as an innovative and courageous war cinematographer. While in the Middle East, he very quickly learnt that to shoot the best possibly footage, he needed to be amongst the front-line soldiers. Furthermore, as his skills with a hand held motion picture camera improved, he found himself in demanding a variety of assignments, covering the war in the Middle East from aircraft, naval ships and dug-outs alongside ground soldiers. This is the newsreel, Kokoda Front Line, introduced by Damien Parer with footage shot by him, showing the anguish, despair and heavy fighting in New Guinea. Although, the academy award brought Parer international recognition and fame as a war correspondent, when all is said and done, Parer’s didn’t care much about fame. What he cared most about was the men who were sacrificing their lives in the jungle fighting. In an attempt to film more exploits of Australian soldiers, Parer asked the Department of Information , (who employed him) for more resources. Unfortunately, they were not willingness to spend more money. Parer, unhappy, eventually resigned his post and was quickly hired by the American company Paramount News. In his last year he covered the war following United States Marines, first in Guam and finally in Peleliu, where he died on September 17th 1944. He was buried in Ambon war cemetery and was duly mentioned in many dispatches. Fortunately, for all Australians today, Damien Parer memory still lives on and his war newsreels stand as a testimony of the courage of all Australians who fought and died during the Second World War. Photo Credit: All images are courtesy of the Australian War Memorial. They are in the public domain and catalogued as followed: Header image of Damien Parer ID No. 000401. 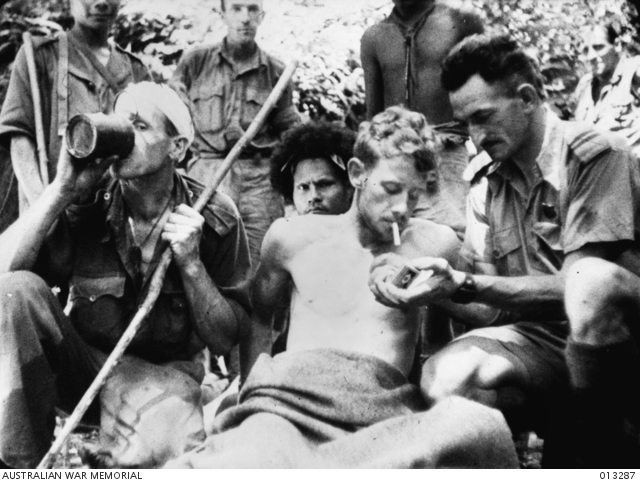 Photograph of Australian soldier smoking ID No. 013287. 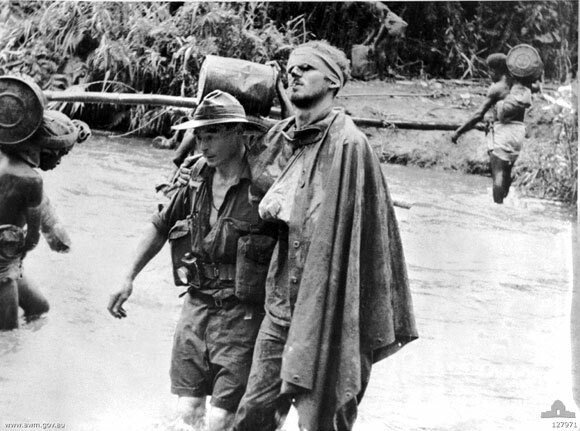 Photographic still of wounded soldier crossing river ID No. 127971. An in-depth look at one of the photojournalists. We still watch his newsreels today! These footnotes in history often leave a large footprint, Robert. Good job! Thanks! Excellent tribute to Parer, an exceptional war photographer, I believe that second picture is his iconic picture that most Australians will remember him for. Thanks for posting this newsreel to see the war as it really happened. Those photographers and reporters cared deeply about our country and showed great bravery.I can remember old newsreels at the movie theaters, but not this far back. A very courageous man indeed. One doesn’t always think about the photographers and correspondents of war. Extraordinary at what he did and a very sad loss. Constantius II, the Byzantine autocrat (Part 1).